Crowborough Beacon Golf Club (CBGC) are the owners of the absolute freehold title to the land known as Crowborough Common. Their title is registered at the Land Registry and is therefore guaranteed by the State. The land was formerly the waste of the Manor of Alchorne which CBGC purchased from the 8th Earl De La Warr on 29th January 1906. At that time, general access to this land was limited to commoners whose rights to pasture their beasts on the common were recorded in the Alchorne Manorial Court records. The general public’s legal access was restricted to travel along recognised paths and bridle ways. However, subsequent Acts of Parliament have changed this and the latest situation can be seen in the Legal Documents section of this website. For over 150 years, historians described the Manor of Alchorne as “The Lost Manor”, due to the fact that no legal documentary evidence of the existence of a Manor House has ever been traced and the uncertainty over ownership before 1563, when Queen Elizabeth I gave the Manor to Sir Richard Sackville. The Queen later made his son Thomas Baron Buckhurst the 1st Earl of Dorset and the Manor remained in the Dorset line until 1815 when ownership passed to the then Countess De La Warr, staying with the De La Warrs until the waste of the Manor was purchased by Crowborough Beacon Golf Club in 1906. When planning to celebrate the centenary of their ownership, in 2005, CBGC investigated the history of the Manor of Alchorne, researching the subject under the following headings. A summary of this research is given below. This brief review is based on Modern Law of Real Property by Cheshire and Burns and The Law of Real Property by Megarry and Wade. In 1066 William I needed soldiers, money and the loyalty of the Saxons. To meet these needs the Normans imposed their feudal land system on England, the central component of which was the manor. The Crown vested each manor on grantees and in return the Lord of the Manor provided the necessary money and soldiers. So long as he remained loyal to the King, the Lord of the Manor was allowed to hold his manor, or group of manors, free from legal and administrative central government control. Each manor was divided into three sections. 1 - The lord’s manor house and his own cultivatable land. One of the problems in researching Alchorne is that whilst there are several oblique references to a manor house, there is no documentary evidence of such a building ever having existed. 2 - Land held by tenants in either free or unfree tenure. Free tenants tenure was based on services to their lord that were fixed as to quantity and quality e.g. 40 days military service per annum. Unfree tenants were deemed to occupy land on their lord’s behalf and had to work whenever and at whatever the lord ordered. 3 - The waste on which free and unfree tenants (the commoners) could pasture their beasts. Non tenants access was limited to travel on designated paths and bridle ways. It was the waste of the Manor of Alchorne, which included what by then was called Crowborough Common, that CBGC purchased in 1906. The lord’s and tenanted land having already been sold off over the years. Service related tenancy remained until the late 14th and early 15th centuries when the Black Death of 1349 and 1361, together with the Peasants Revolt of 1381, provided the catalysts for major changes in the feudal system, particularly for service tenancy to be replaced by rent with wage earning labour. The Tenure Abolition Act 1660 formally abolished land holding in return for services. From then until 1925 two manorial tenures dominated land ownership, namely copyhold and freehold. Copyhold tenure was by a copy of the entry in the manor court records, whilst freehold was proved by investigating past transactions recorded in the deeds. The Law of Property Act 1925, along with associated acts effectively divided estates into freehold and leasehold, with three titles under which freehold ownership could be registered, namely possessory, qualified and absolute. Absolute is the most secure, with the title investigated, registered and guaranteed by the State. 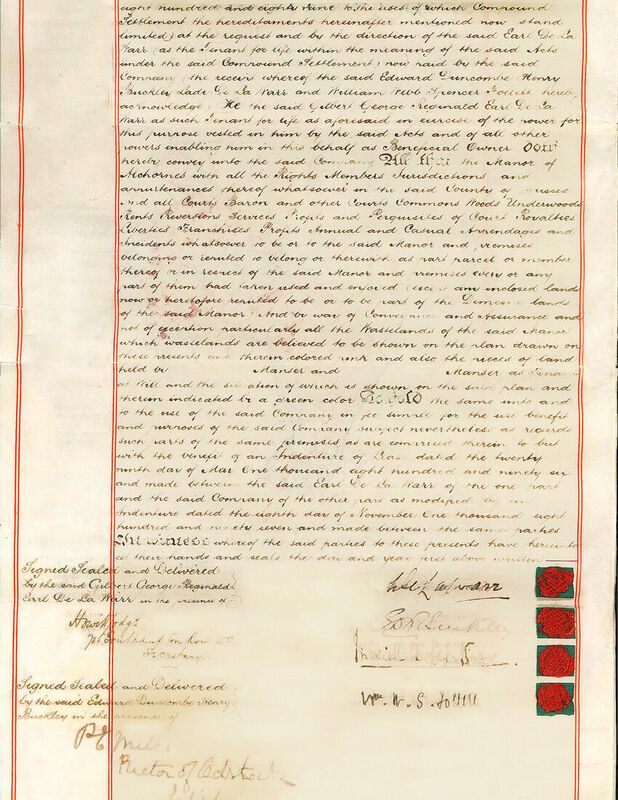 On 21 April 1992 HM Land Registry granted CBGC Limited freehold title absolute to the Manor of Alchorne land, which included Crowborough Common, purchased from the 8th Earl De La Warr in 1906. Considerable confusion reigns over the names of places mentioned in the Domesday Book. This is the result of translation, the evolution of names and mass illiteracy which over the years resulted in clerks recording what they heard without being able to ask people to spell out a name which was not clear to them. 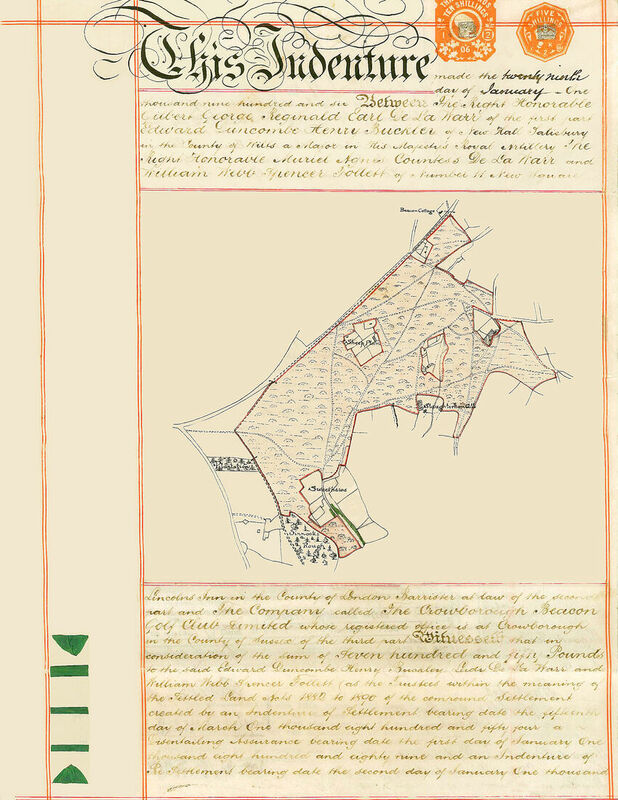 The original Domesday Book records that in Sussex William da Cahaignes held the Manor of Alsihorne, but “The Domesday Book – A Complete Translation”, edited by Dr Ann Williams and Professor G H Matin records that Archbishop Lanfranc holds the manor, but William de Keynes holds a virgate of this manor and it is Alchin in Buxted. Unfortunately the Domesday Book did not include maps, but in the early 20th century H.C.Darby and G.R.Versey produced a Domesday Gazetteer giving their assessment of where all the manors mentioned in 1086 were situated. Their positioning of Alsihorne (Alcin) mentioned in the Domesday Book is in the middle of the map of the Manor of Alchorne shown in Catharine Pullein’s 1928 book “Rotherfield – The Story of Some Wealdon Manors”. It is virtually certain that Alsihorne, Alcin and Alchorne are the same manor a record of which stretches back to 1086. From the Domesday Book we can assume William de Keyne held the Manor of Alchorne off Archbishop Lanfranc in 1086 and we know it passed to Sir Richard Sackville in 1563, but who owned it between these dates? In the early 20th century local historians such as L. F. Salzman and Catherine Pullein attributed the ownership of the Manor of Alchorne after 1086 to Ralph de Dene and believed that his daughter Ela married Jordan de Sackville, thus bringing the Manor into the Sackville family. No sources were quoted for this assumption and the Club’s research in 2005 was unable to unearth primary sources that placed the de Dene/Sackville claim beyond reasonable doubt, but it did unearth links with William de Keyne. A History of Sussex Vol. 1, James Street, London 1905 records that the lands of William de Cahaignes, of Keynes were passed to Roger de Leukenors when in 1276 he married Joan, the heiress of the Keynes. The Inquisition Post Mortem (IPM) of 1412 at the Public Record Office makes reference to Alchorne being amongst the Leukenor family lands. The Court Rolls of Henry VII Portfolio 206 p307 No.33 mentions Alchorne but with no named grantee, indicating at that time it was Crown land. How did the Leukenors lose Alchorne? During the 15th century, Leukenor became Lewknor and after deposing his nephew Edward V, Richard III seized the lands of Sir Thomas Lewknor who had supported the Lancastrian's cause in the Wars of the Roses. However, after Richard III was killed at the Battle of Bosworth in 1485, Henry VII returned Bodiam Castle to the Lewknor family. On the evidence available it would appear the King retained the Lewknor Alchorne land which remained in crown hands until Elizabeth I granted Alchorne to Sir Richard Sackville in 1563. Alchorne was not lost between 1086 and 1563, but the Lordship of the Manor title chain remains shrouded in the mists of time. The History of Parliament reports that Richard de Sackville was known as “Fill-Sack” by reason of his great wealth and hunger to acquire land and that he left a vast patrimony to his son Thomas when he died in 1566. Thomas accumulated even more wealth, he was awarded the Knole estate by the Queen and held many important posts; Member of Parliament, Justice of the Peace for Sussex, Lord Lieutenant of Sussex, Amabassador to France and then the Netherlands, Chief butler of England, Commisioner of the Great Seal, Lord Treasurer and Chancellor of Oxford University. Clearly one of Queen Elizabeth’s favourites. The Manor of Alchorne remained with the Dorset line through to the 19th century, the 7th Earl of Dorset having been created the 1st Duke of Dorset in 1720. However, the Dorset titles became extinct on 29 July 1843 when the 5th Duke of Dorset died without a male heir. The Dorset succession became linked to the De La Warrs at the beginning of the 19th century. The 3rd Duke of Dorset married Arabella Diana Cope in 1790 and they had three children, George, Elizabeth and Mary. In 1813 Elizabeth married the 5th Earl De La Warr and when the 4th Duke of Dorset, her brother George, died, unmarried, in a hunting accident in Dublin in 1815 the Dorset title went to a distant relative, but along with Buckhurst and other Sussex manors, Elizabeth Countess De La Warr inherited the Manor of Alchornes. The Manor remained with the De La Warrs until the remaining lands were purchased by CBGC in 1906. Alchorne was never lost, just overlooked. Surely few, if any golf club can match Crowborough Beacon’s land title chain which stretches right from the Domesday Book to the present state guaranteed absolute freehold title they hold today.